William Morris (1834 �1896) was an English designer, writer, businessman, political activist and conservationist. He was a painter, decorated churches, was an interior decorator, and designed furniture, tiles and tableware, stained glass, wallpaper and textiles. Finally he was also a calligrapher designing type faces. His businessman endeavor included the foundation of a firm of decorators who were also artists, with the view of reinstating decoration, down to its smallest details, as one of the fine arts. Its most famous incarnation was as Morris & Co. and the firm's designs are still sold today under licenses given to Sanderson and Sons. When his business was enlarged in 1881 by the establishment of a tapestry industry at Merton Abbey Mills in Surrey, Morris found yet another means for expressing the medievalism that inspired all his work whether on paper or at the loom. The Abbey was originally structured for textile printing and included several buildings and a dye works. Morris modified the various buildings for the production of stained glass, textile and fabric printing, tapestry, and carpet-weaving. Morris & Co. (1875�1940) were furnishing and decorative arts manufacturers and retailers. The firm's medieval-inspired aesthetic and respect for hand-craftsmanship and traditional textile arts had a profound influence on the decoration of churches and houses into the early 20th century. Although its most influential period was during the flourishing of the Arts and Crafts Movement in the 1880s and 1890s, Morris & Co. remained in operation in a limited fashion until its closure in 1940. Henry Dearle (1860-1932) was a textile and stained glass designer trained by William Morris. Dearle designed many of the later wallpapers and textiles released by Morris & Co and contributed background and foliage patterns to tapestry designs. Beginning in his teens as a shop assistant and then design apprentice, Dearle rose to become Morris & Co.'s chief designer by 1890. He created designs for tapestries, embroidery, wallpapers, woven and printed textiles, stained glass, and carpets. One of Dearle�s designs was �Cherwell�, a pattern derived from 17th century velvets that Morris had introduced. Morris favored diagonal designs so they would remain attractive when gathered or pulled back. �Cherwell� was designed in 1887 as a wood block print on velveteen and when later applied in 1890 to wallpaper, became known as �Double Bough�. This pattern was ordered by Mary Isobel Barr Smith, a wealthy client in Adelaide, Australia. The �Cherwell� velveteen curtains and the �Double Bough� wallpaper were used in the drawing room of Birksgate, a circa 1900 mansion in south Australia. 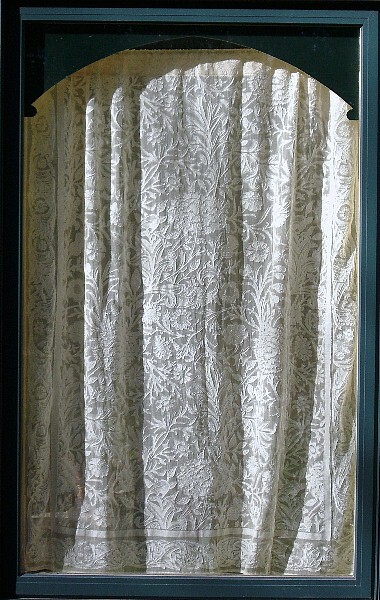 This 100% cotton lace curtain will coordinate perfectly with Colonial Revival, Craftsman Shingle, Elizabethan, Queen Ann and Tudor Revival and other 1870 - 1920 period decor.